Hey, it is sunny here today! It is quite possible that Spring weather is here to stay... This clear day is putting me in the mood for playing with colors, speaking of which - how do you like my latest wall hanging? The colorful border has all the hues I chose for the hexie flowers, and it brightens the whole thing up. I love attaching the hexies with a zigzag stitch using contrasting color. I used monofilament to quilt the grey background (can you tell I was craving jelly beans as I was quilting? ), and also to quilt around the paisley shapes on the border. A single block is all it takes to come up with a wall hanging, a pillow, a bag, or an apron, and it is perfect for those days when you want to sew but do not want to work on a large project. 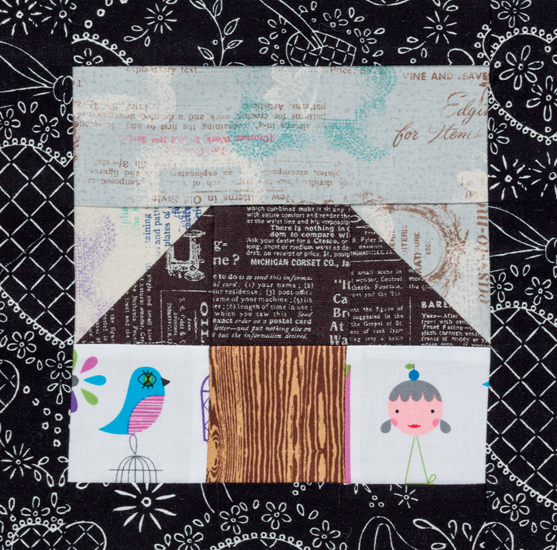 This fun block came from the cover of "25 Patchwork Quilt Blocks, Volume 2" by Katy Jones, which I received from Martingale for review. 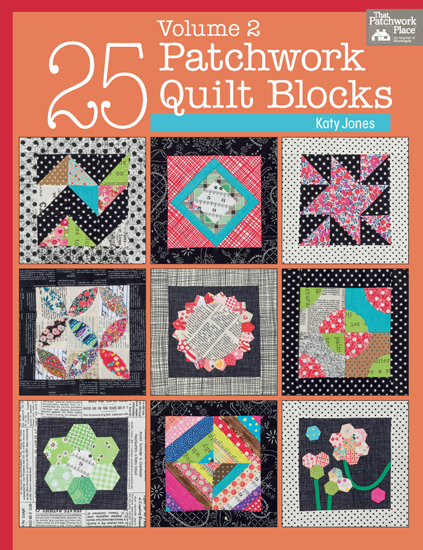 Yep, I have been getting a lot of inspiration from their books lately... Katy used traditional blocks and techniques, such as applique and English paper piecing, livened them up with modern fabrics, and gave us 25 great ideas for quick projects as well as larger quilts. Each block finishes at 6" (8"with borders), although I made mine really big: the center block measures 11" and the final wall hanging is 19" x 19". ...how about this dresden plates and hexies quilt? It is called "Field of Daisies", perfect for a girl's room, although Katy says she designed it for picnics, a usually rainy affair in her native United Kingdom. I am really tempted to start on this project today... and I have the right fabrics in my stash. If you are a beginner quilter, the introduction gets you through the details you will need to get started. The pattern instructions will make your work easier, as they are clear and have many diagrams. As a seasoned quilter, you will enjoy her new ideas. I have just a couple of hours to quilt before my kids get home from school. Enough time to work on the first dresden block! Awww, love the hexi flowers! I need to make one of these! What a cute hexi project. I'm going to have to get that book! It's on my wish list, Denise. Then I love all things hexie. 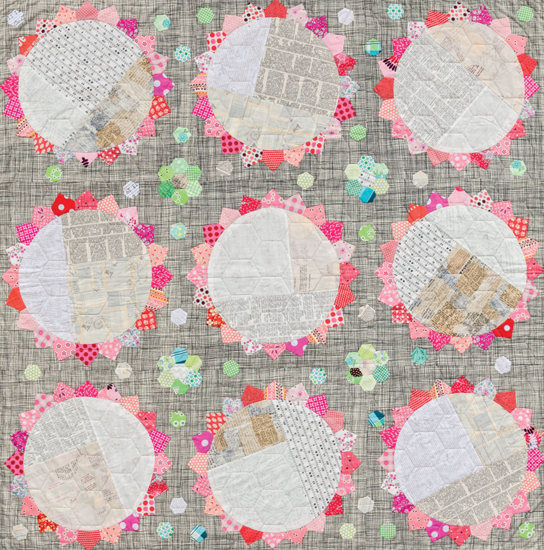 I invite you to link to hexie weekend (closes Monday, midnight) and share the review - what a great Dresden quilt too! 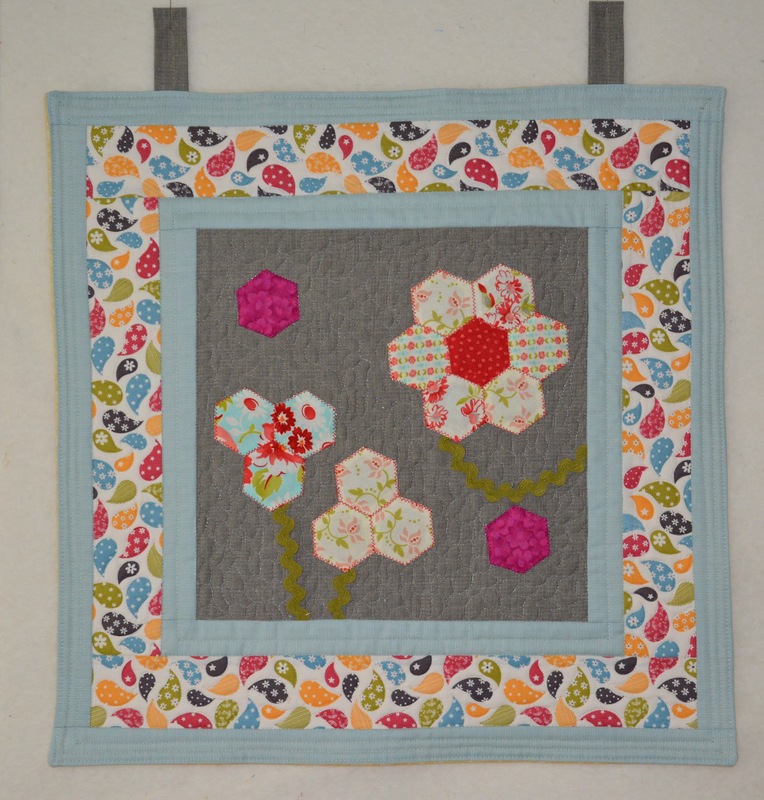 Great review Denise and I love your little hexie wall hanging!